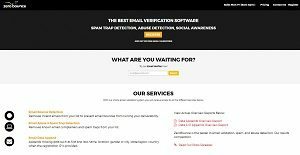 ZeroBounce is email verification software that specializes in email validation as well as spam and abuse detection. The system helps companies improve deliverability of complex and high volume emails and avoid factors that can ruin their sending reputation. This is by its ability to detect invalid, inactive, and spam-trap email addresses that causes messages to bounce. The software can also validate IP addresses and verify primary recipient demographics. This allows the system to fill in missing information such as a recipient’s name, gender, location and other details, as long as a registered IP is detected. The ZeroBounce validation system is secure so that users are ensured that their data is kept safe and private. ZeroBounce’s primary feature is its email validator that can accurately detect spam traps. Its verification capabilities can also recognize email addresses that have been previously marked under spam emails and have a track record of bouncing back messages emailed to them. Email validation API can also link with user’s separate software to validate emails. By being able to detect undesirable email addresses, users can manage their databases more effectively and prioritize sending messages only to the right recipients. The software has disposable email detection tools to flag temporary email accounts used to mask real email addresses. ZeroBounce can also discern toxic domains that are notorious for abuse, spam, and bot created messages. Catch-All domain detection distinguishes domains which return valid for all emails. By having these security features in place, users are assured of the safety and privacy of vital company data. ZeroBounce’s Social Append tools help reduce the tedious work involved in filling up missing parts of email addresses. The software’s email verifier can identify the first and last name, location, age, and even the gender of email recipients. These help make email dissemination more productive and less time-consuming. Users simply need to supply the registration IP for the email verifier to append missing data. All the data related to verified emails and detected undesirable domains and addresses are laid out in overview reports. These provide users with a comprehensive review of what their data looks like, thus allowing them to develop better email campaigns and prioritize who needs to receive them. Enterprises have unique needs and requirements and no software platform can be perfect in such a scenario. It is futile to try to find an ideal off-the-shelf software system that fulfills all your business wants. The wise thing to do would be to adapt the solution for your special needs, employee skill levels, budget, and other factors. For these reasons, do not rush and pay for well-publicized popular applications. Though these may be widely used, they may not be the best fit for your particular needs. Do your groundwork, look into each short-listed application in detail, read a few ZeroBounce reviews, speak to the vendor for explanations, and finally settle for the application that provides what you require. How Much Does ZeroBounce Cost? We realize that when you make a decision to buy Email Management Software it’s important not only to see how experts evaluate it in their reviews, but also to find out if the real people and companies that buy it are actually satisfied with the product. That’s why we’ve created our behavior-based Customer Satisfaction Algorithm™ that gathers customer reviews, comments and ZeroBounce reviews across a wide range of social media sites. The data is then presented in an easy to digest form showing how many people had positive and negative experience with ZeroBounce. With that information at hand you should be equipped to make an informed buying decision that you won’t regret. What are ZeroBounce pricing details? What integrations are available for ZeroBounce? There is no information available about ZeroBounce’s specific third-party integrations.